Purios System may be used in buildings from their foundations up to the roof. It is also suitable for industrial constructions e.g. to insulate steel constructions, cold stores or inventory buildings. Components of top quality used in the production process guarantee it that foam does not get older over 25 years. With the natural environment in our minds, Purios systems do not contain substances which deplete the Earth's ozone layer. Modern production in Poland, own R&D department, numerous patents and everyday sample tests ensure the highest standard of the product. 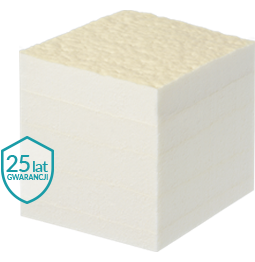 Open-cell foam is mainly used to insulate building interior. It is open-cell in 90%. It is characterized by a low diffusion resistance of steam, which is why humidity is not stopped in the insulation layer. Open-cell foam has λ of at least 0.033 which makes it possible to significantly lower energy costs in buildings. Aside from its classical use in construction industry, Purios closed-cell foam is used to insulate steel constructions of any type, cold stores, pipelines or inventory buildings. Foam shows waterproof properties and extremely high compression strength. Closed-cell Purios foam has λ starting from 0.20. Purios foams are used worldwide: from Argentina to Japan, from the USA to Russia. The innovative technology enables the products to be used in different climatic zones: wet and dry, still maintaining the application standards. Foam holds CE, ITB certificates and PZH attestation.